For ONSEN, manufacturer of energy management systems for public buildings, the main asset of elecworks™ lies in the ability to conduct a simultaneous mechanical and electrical design and benefit from 3D visualization of a system’s total space in the early design phase. Electrical schematics progress in parallel with the mechanical portions instead of waiting for their completion. The 3D model thus saves considerable time – with estimated time gains above 50% – it is used for customer validation and to order components and cables to required lengths well in advance of the projects manufacturing stage. 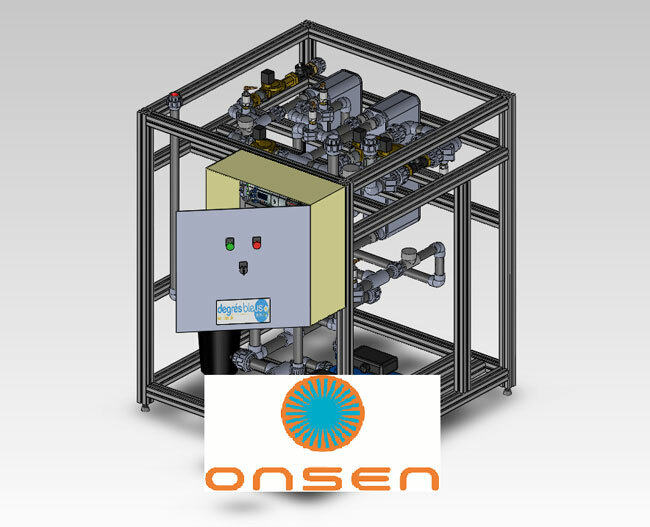 Based in Villefranche-sur-Saône (Rhône, France), Onsen is the result of the 2010 alliance between the French company Lyonnaise des Eaux, itself a subsidiary of Suez Environnement, with Domelys Technologies who sells a patented waste water heat recovery system. The idea is to use the heat of released waste water to heat the incoming hot water circuit thus saving energy. The system carries waste water in a heat exchanger suitable for all buildings existing or under construction (public buildings, swimming pools, nursing homes, etc.). The design office, already equipped with SolidWorks for mechanical design, was looking for another sofware that could be integrated to join the two phases of mechanical and electrical design but also to enjoy the wide range of opportunities offered by SolidWorks 3D design. Certified Gold Product, elecworks™ met these criteria. «Compared to a traditional schematic software such as AutoCAD Electrical, we were pleasantly surprised by its user-friendliness. elecworks™ is easy to use and enables electrical design in 3D,» says Jerome Policard, electrical designer. The design team quickly realized the real advantage of using 3D in electrical design, made possible through the full integration of SolidWorks and elecworks™: 3D visualization gives an overview of space constraints and allows easy adaptation to existing buildings. «Before, we used to progress slowly and blindly. We had to go on site to check our calculations and manufacturing took much longer,» said Jerome Policard. «Now we realize, from the onset of the project, all the manufacturing problems that arise and we have no more surprises: we know what will be possible to design into the building.». Used since 2010, elecworks™ reduced, by half, the design time. Electrical schemes are designed progressively as the mechanical design progresses. After an initial software configuration with their own library and their own specific components, the user has developed standard macros to standardize design and re-use repeated patterns instead of redesigning from scratch. Next steps are the 3D panel layout and the automated cable routing from the cabinet to electrical actuators linked to pumps and valves. After a week of both mechanical and electrical design, the 3D model is automatically generated to guide subcontractors or for customer validation on the total space taken before starting production.